What is included in a school visit? A full day visit consists of 4 presentations, a lunch with either students or staff, and a book signing at the end of the day. Half day visits include 2 presentations and a book signing afterward. How do I set up a visit? Organizing an event is a snap. All my school visits are coordinated through my amazing event manager. She is efficient, helpful, and incredibly easy to work with. Grants are occasionally available through district offices or corporate sponsors. (Target has a great program offering $2000 grants for bringing arts into your school. But even without these, if a school wants a visit I am very flexible in finding a reasonable way to make it happen. Virtual events via Skype are also a great way to connect while on a limited budget. Who do I contact at my school to arrange a visit? While the PTA is usually the source of funding for my school visits, anyone can schedule and arrange a visit. Librarians, teachers, parents and principles are all common organizers for an event. How much prep time is needed? Between the school’s prep work and mine, 4 weeks is usually a safe bet. Making sure I have enough books is one factor. Coordinating the schedule also sometimes takes a little work. In addition, an event usually has the most impact when students are familiar with an author’s work, so I highly recommend that all students hear Enemy Pie before I come to the school. Which presentations are the most popular? The Enemy Pie Experiment for K-3 is easily the most popular. For grades 4-6, the Wild Ideas presentation is best. The writing workshops are awesome, but I do them less frequently because they max out at 60 students. What about visiting schools out of state? I love having the opportunity to see other parts of the country and beyond. While travel is expensive, schools can often make it work by splitting the cost between schools. 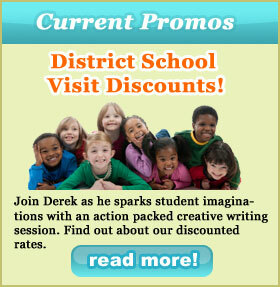 The discount offered for multi-school visits will usually cover the additional costs for travel and lodging.